As I dig myself out from under the debris of the holiday season and try (emphasis on “try”) to acclimate to normal and regular life again – which, in my mind, should include preparing regular dinners that are heavy on the veg and light on decadence – I’m finding it hard to make the whole holiday to regular life transition. Since New Year’s was on a weekday I’m pretty sure the holiday fog won’t be lifting until at least next Sunday, so I’ve written the rest of this week off as post-holiday recovery with the goal to emerge next Monday refreshed. 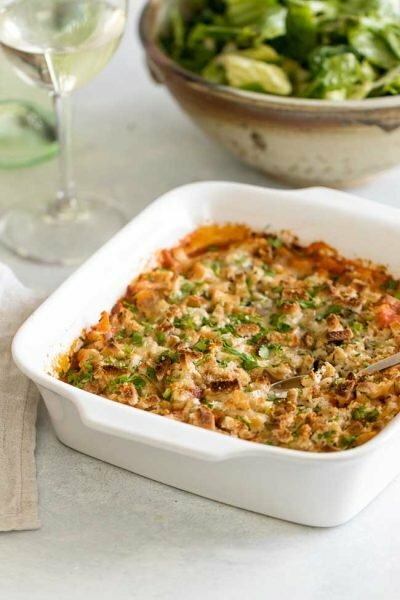 In the meantime, I’m dusting off an oldie-but-goodie (I first shared this recipe back in November 2015) that aligns with the whole post-holiday lighter-eating goal. 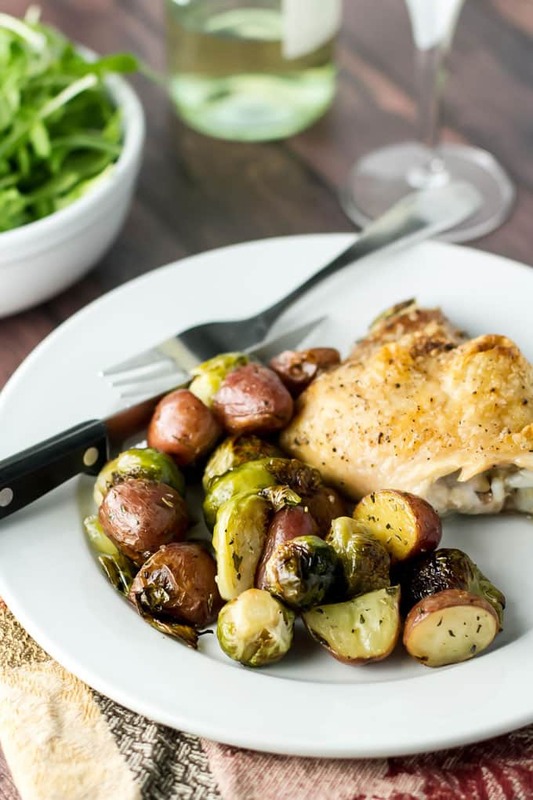 An easy one pan roasted chicken with veggies that you need about ten minutes to prep, about 30 minutes in the oven, and just one sheet pan to make it all happen. It’s a simple dinner for these early days after the holidays when you’re craving something healthy-ish, but you’re low on energy and motivation. Bone-in, skin-on chicken thighs: I chose chicken thighs for this recipe because they have a lot of flavor on their own without having to dress them up with a sauce. They also take well to roasting and come out the oven juicy and tender. Petite red potatoes: They have pretty red skins (no peeling required!) and they hold up well to roasting emerging from the oven lightly crispy on the outside and creamy on the inside. 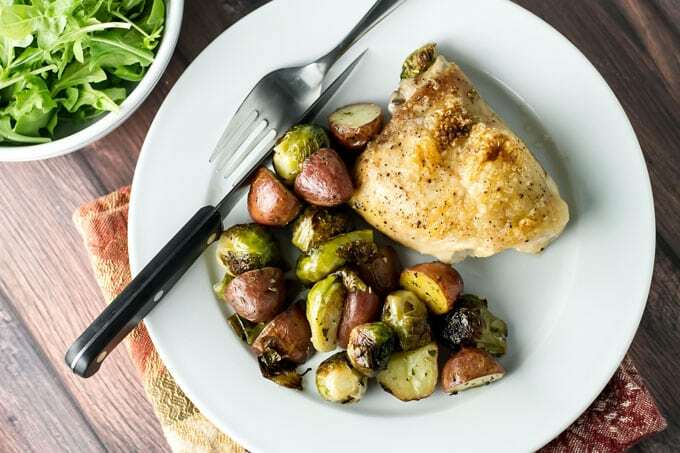 Brussels sprouts: Like the potatoes, Brussels sprouts hold up well to roasting. Cooking them in a hot oven tames their bitterness and draws out their natural sweetness. Olive oil: I like to brush some oil on the chicken to help the skin crispy as it roasts and the veggies get a generous drizzle, as well. Herbes de Provence: A mixture of dried oregano, rosemary, thyme, lavender, and tarragon Herbes de Provence is my favorite herb blend to use for roasting. It’s so aromatic and the flavor it imparts is very distinctive. That said if you have dried Italian seasoning on hand that works well, too. I like to season the chicken thighs generously with salt and pepper. Place them on a sheet pan lined with tin foil. 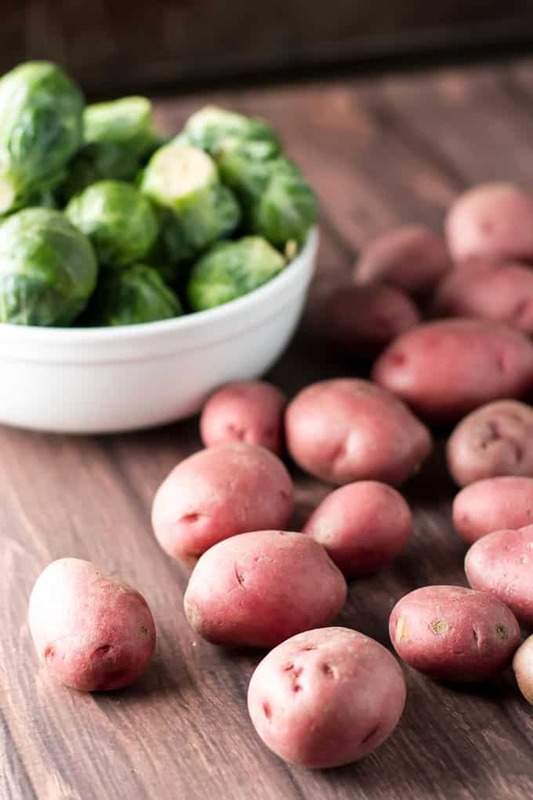 To ensure they roast evenly, cut the potatoes and Brussels sprouts approximately the same size. I usually cut the large ones into quarters, the medium-sized ones in half, and leave the small ones whole. 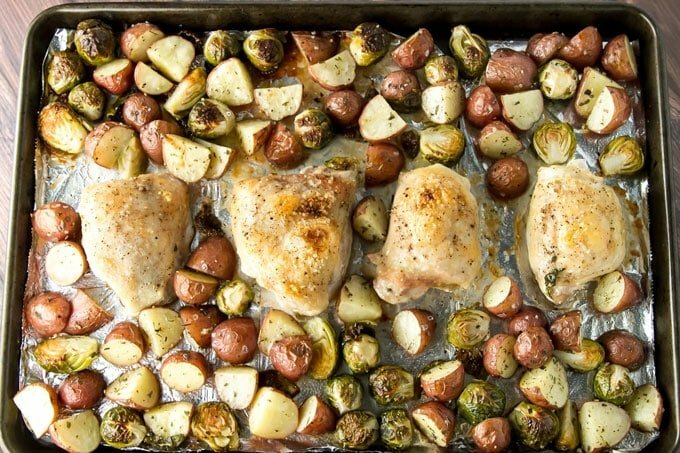 Scatter them around the chicken on the sheet pan. The veggies need a good drizzle of olive oil and, as I mentioned above, I like to brush the tops of the chicken thighs with olive oil, too. Roast the chicken and veggies at 425°F. I find that everything is cooked through in about 30 minutes, but depending on your oven this may vary. You may need a few extra minutes for the chicken, which is fine. Use a meat thermometer to check the temperature of the chicken. Once it’s at 165°F you can take it out of the oven. If you want extra crispy skin, you can turn the oven to broil for a couple of minutes to further crisp the skin. Just keep an eye on it so it doesn’t burn. P.S. 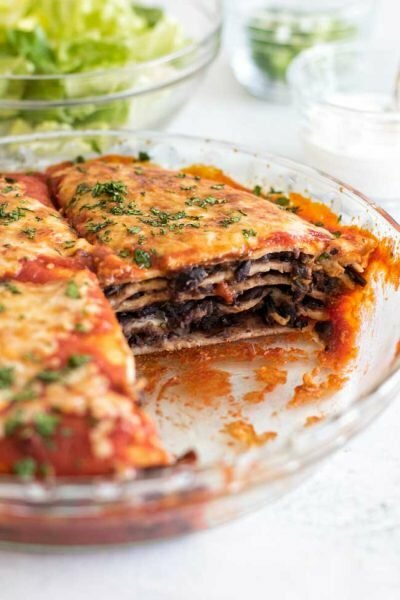 This post and recipe was first published in November 2015. Only the post has been updated – the photos and recipe are the same. 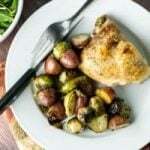 Caramelized Brussels Sprouts, tender red potatoes and roasted chicken makes an elegant and delicious dinner. The best part? You only need one pan to pull it all together. 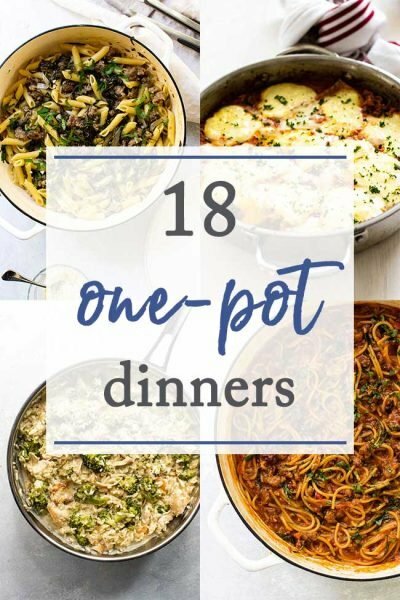 Hello, amazing weeknight dinner! Preheat oven to 425°F. 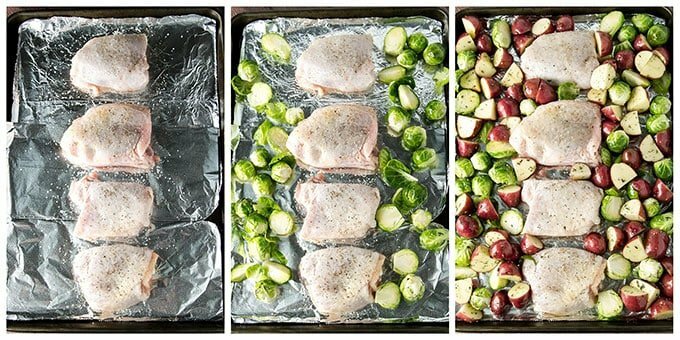 Line a baking sheet with tin foil. Place the chicken thighs on the baking sheet and season both sides with salt and pepper (a few pinches of each). With the skin side up, lightly brush the skin with olive oil (1 tablespoon total across each chicken thigh). Spread the Brussels sprouts and potatoes out evenly on the baking sheet. Drizzle them with the remaining olive oil (2 tablespoons) and sprinkle the Herbes de Provence over the top. Sprinkle a few pinches of salt and pepper over the veggies, too. The secret to success with this is making sure the potatoes and brussels sprouts are all about the same size. Be sure to cut the big Brussels sprouts in quarter or halves and the same with the potatoes. This will ensure they all are ready at the same time. Depending on where your racks are positioned in the oven, the degree of crispiness you get on the skin may vary. One way to got extra crispy skin is to leverage your broiler at the end of the bake time. After 25 minutes, turn the oven to broil, move the baking sheet to the top rack and let the chicken crisp up for a few minutes. Be sure to keep a close eye on it! Always check the internal temperature of the chicken – it should be at least 165°F before you serve it. Easy, quick & delicious. I took vegetables off cooking tray at 30 minutes & left chicken under broiler for 5 minutes. 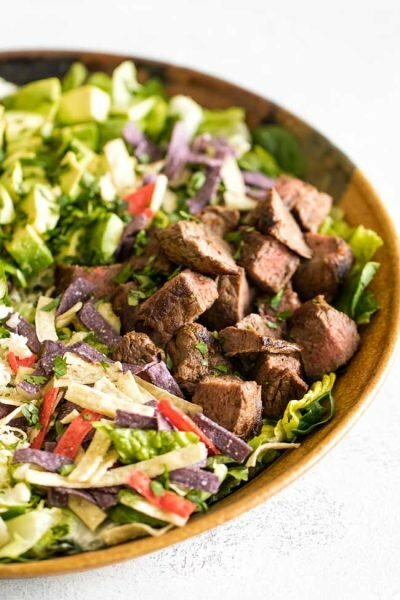 The dish is very tasty and easy to make. However the chicken thighs need much more time than the veggies to cook and the recipe needs to be adjusted accordingly. The recipe with chicken breast went well! Evoo beforehand and it turned out great! Oh, that’s great! Thanks for letting me know! Hi Abby, I haven’t tried this with boneless skinless chicken so I’m not sure how it would turn out. The skin-on chicken thighs have more fat, which means they stay moist and juicy, so if you try this with skinless breasts you may want to brush them with olive oil otherwise they might get too dry. Let me know if you try it and how it goes, sorry I can’t be of more help! 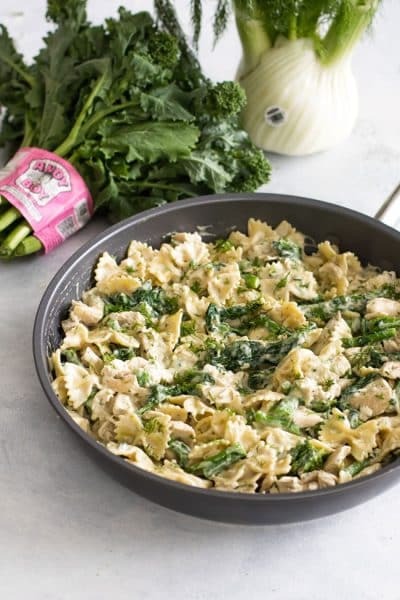 You can’t go wrong with one pan dishes! I love cooking with chicken thighs. 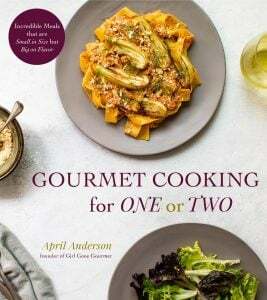 I will be making this one!